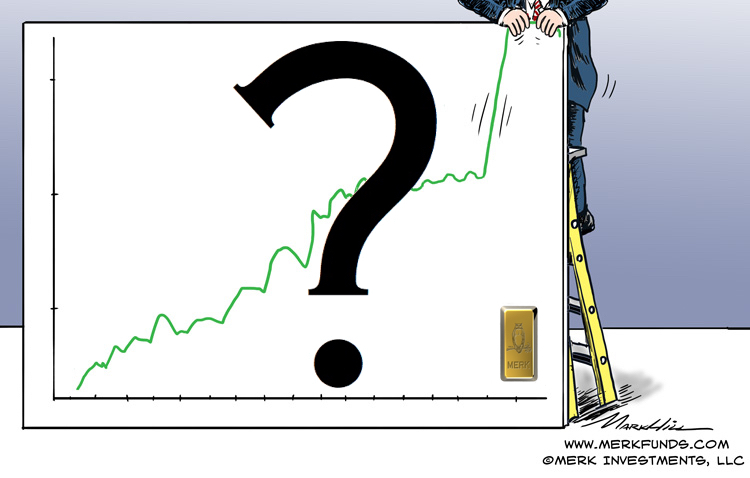 Merk Insights - Gold to Beat Stocks? 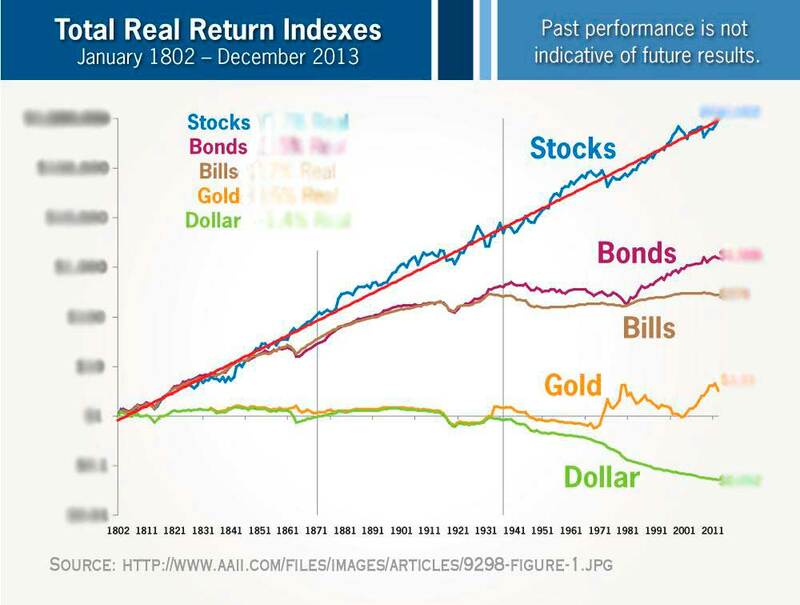 "Stocks beat gold in the long run!" is a 'rallying cry' to buy stocks we have heard lately that gets me riled up. It’s upsetting to me for two reasons: first, an out of context comparison, in my opinion, misguides investors. It might be the wrong assertion in the short to medium term. 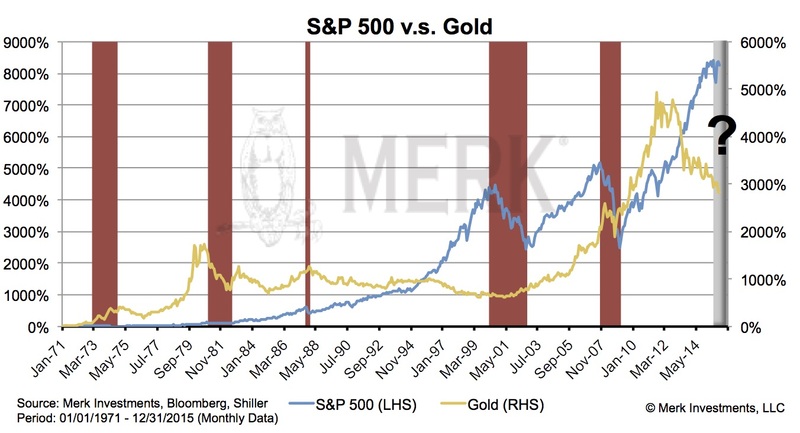 The dollar was linked to gold for most of the period that chart shows. The link persisted until 1971; the outperformance of gold versus cash prior to 1971 is attributed to official debasements of the dollar. Let’s have a closer look at the performance of bonds from the end of the Great Depression until Paul Volcker became Chairman of the Fed (that was in August 1979). That negative performance has a good reason: we experienced an environment of financial repression as real interest rates were negative. It’s that sort of environment that we believe is favorable to gold as receiving no interest is better than negative real rates. However, gold couldn’t react at the time, because of the link between the dollar and gold. The 'gold window' closed because the U.S. could no longer sustain the link; not surprisingly, the period after 1971 was rather volatile and distortions (the boom/bust of 1980) were a side effect. If I look out 10 years and consider the projections of U.S. deficits, I have a hard time seeing how we can afford positive real interest rates. This may bode well for the price of gold. But will gold outperform stocks? I happen to be very negative on stocks in the current environment. Last August, before the sharp selloff in equities, I published a newsletter Coming Out - As a Bear! ; the basic premise of the analysis is that the Fed had “compressed risk premia,” i.e. bid up asset prices and taken fear out of the market. For years, investors piled into risky assets, such as equities, not appreciative of their inherent risks. As part of that process, they are likely now over-exposed to equities, having ‘bought the dips’ rather than prudently diversifying. It seems the mentality is gradually shifting towards capital preservation, i.e. ‘selling the rallies,’ but this is a process that, in my assessment, will – at a minimum – take months. I’m not suggesting that everyone should go short equities; such a strategy is fraught with many risks. But I believe there may well be times when gold can outperform. My risk tolerance allows me to put my money where my mouth is; any investor, though, should carefully evaluate how much money they allocate to gold, as the price of gold can be rather volatile measured in U.S. dollars. That, by the way, applies to stocks too. Please register for our upcoming Webinar entitled ‘Gold to Beat Stocks?’ on Thursday, February 25, to continue the discussion. Also make sure you subscribe to our free Merk Insights, if you haven’t already done so, and follow me at twitter.com/AxelMerk. If you believe this analysis might be of value to your friends, please share it with them.